Linn County Auditor Joel Miller says he is still receiving sample ballots his office sent out recently for informational purposes. The mailers also included an absentee ballot request form, an addressed envelope, and a letter noting “this ballot cannot be used for voting, ” but hundreds of people have filled them out and sent them in — creating a concern those people think they’ve voted when they have not. Some Linn County Supervisors were visibly upset at Wednesday morning’s meeting as they discussed the rising number of filled out sample ballots continuing to be sent back to the Auditor’s office. “It is almost criminal to not try to address this issue with urgency,” Supervisor Stacey Walker said. 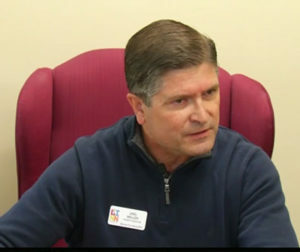 No action was taken by the supervisors but many expressed concerns over how auditor Joel Miller is handling the situation. The Auditor’s office tells KCRG TV 9 at last count, which they took on Monday, they’ve received a total of 750 sample ballots back. 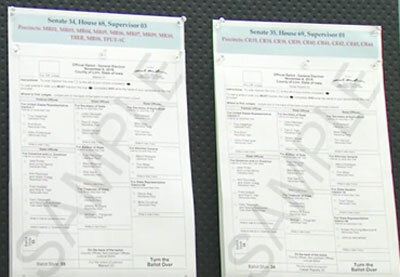 Those who sent in sample ballots, who provided a return address, have been sent back an additional mailer informing them they had not sent in a real ballot. 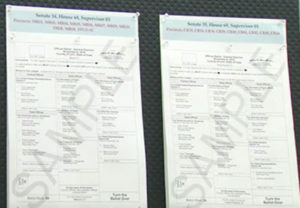 Supervisors invited Miller to the meeting to tell them where the current number of sample ballots received stands, however, Miller was a no show. Supervisor John Harris said he thinks one of the reasons the auditor did not show up was the auditor he saw the likelihood of the discussion being political theater and decided to avoid that. Harris was asked if he agreed with that assessment. “I do,” he replied. Some believe the steps the Auditor’s office has taken do not go far enough. Earlier this week, in an unprecedented move, the party chairs of Linn County Democrats, Republicans, and Libertarians issued a joint statement criticizing Miller for in their view “not taking sufficient action to contact the individuals” who sent in sample ballots. The chair of the Linn County Democrats Brett Nilles talked to KCRG TV 9 about the concerns of the political parties. “He needed to make clear that this was something that people should be aware of and once they started coming in to make a public announcement,” Nilles said. Nilles echoed a similar sentiment at the meeting as it’s his opinion the only way to ensure there is no more confusion among those who sent in sample ballots is to contact them personally with a phone call or if needed a home visit. Miller believes that is impractical. “I think that’s an unrealistic expectation,” Miller said. If you think you may have sent in a sample ballot by mistake, the Auditor’s office says you can call them at 319-892-5300. This Saturday at 5 p.m. is the deadline to request an absentee ballot.